Extreme Networks/Zebra/Motorola RFS7000 offers a security-oriented businesses need reliable hardware such as the Wi-Fi controller RFS7000 from Motorola. 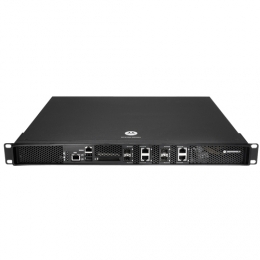 It is specially developed for demanding business networks with a large bandwidth. The Motorola multi-thread operating system Wi-NG Wireless Next Generation offers you complete security, reliability and mobility for powerful 802.11n networks. It combines the maintenance of network hardware, software configuration and network parameters completely with built-in processing monitors and tools for troubleshooting and bug-fixing. Thanks to its self-healing function, the Wi-Fi automatically and intelligently adapts itself to changes in the HF environment, thereby closing unforeseen coverage gaps. The remote maintenance feature greatly minimises operating costs. Voice-over Wi-Fi services guarantee cost-saving voice services quality of service improves the voice and video functions and prioritises network traffic for optimal quality. The RFS7000 also contains an integrated firewall wired/wireless, VPN Gateway, AAA RADIUS server and Wireless Intrusion Protection System IPS, to protect against networks attacks and to prevent unauthorised access. Additionally, it guarantees comprehensive security for the Wi-Fi network through the strict compliance of the layered data protection concept for every point in the network.